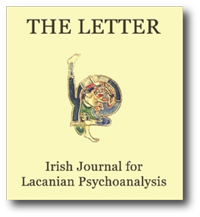 This issue of THE LETTER opens with Cormac Gallagher’s article on sexual difference in The Logic of Phantasy, Lacan’s Seminar XIV held during the academic year 1966-67, which remains unpublished in French, the only English translation of which is that available for private circulation through the working group at St Vincent’s hospital. Regular readers will know that the seminar was the focus of last year’s November congress of APPI, the proceedings of which were published in Issue 15, Cormac Gallagher’s contribution to that publication being a translation of Lacan’s summary of his own seminar. We are delighted to be able to continue an engagement with that particular seminar here. Gallagher’s paper re-introduces us to Lacan’s programme ‘to refine Freud’s use of logic by introducing logical symbolism in a much more explicit way’, culminating in the Phantasy as axiom. Jason Glynos’s paper continues this exploration of Lacan’s formalisation of psychoanalysis. Beginning by looking at the significance of Lacan’s assertion that ‘there is no metalanguage’ when viewed against the backdrop of his other, seemingly paradoxical, claims that ‘the Unconscious is structured like a language’ and that ‘all language implies a metalanguage’, he arrives at a point already underscored for us by Gallagher, – ‘The Unconscious writes’. Olga Cox-Cameron approaches the subject of psychosis via a writing, the one person narrative of Pat McCabe’s novel The Butcher Boy, asking the question of whether that voice is mad from the very start or whether, on the contrary, it is in fact possible to isolate the psychoticising moment in the unfolding narrative. Ironically, in this novel, ‘Pig’, the signifier which signals the triggering of a psychosis and which ultimately and in a not undramatic way emerges from, indeed, is dragged from the body, appears to mirror the ‘Sow’ of the psychotic woman who has ‘just been to the pork butcher’, as discussed by Lacan. Rik Loose’s short article on Freud’s involvement in Otto Gross’s treatment, continues the author’s engagement with the subject of addiction, the possibilities for a psychoanalytic treatment and indeed the impasses which have been encountered in the past. The article, which should be read as part of a work-in-progress, attempts to isolate in the (non-)relation of Freud with Gross the ‘limit point’ of the addiction in relation to psychoanalysis. We intend to include from time to time short articles presentir overviews of the work of various contributors to psychoanalytic theory. In this vein Pauline O’ Callaghan’s Note on Kristeva, while it in no way attempts to be a fully comprehensive account of Kristeva’s contribution, provides a valuable introduction to her work in relation to that of Lacan. In conclusion, Paul Verhaege’s article on the subject of the body traces in considerable detail Lacan’s theorising with respect to the body, particular, the author points out three distinct eras in the evolution of his work, each of which can be understood as the result of a shift in emphasis effecting a transformation in the relations between the real, symbolic and imaginary.